Samsung's Milk service is spilling over into another company offering. Milk VR is essentially a content delivery system for Gear VR. Think of it like YouTube for VR. Milk VR is available for download right now from the Oculus store. Thirty titles are available at launch, and fresh content will arrive daily. Among Samsung's partners is the NBA, which will deliver content from events (we're presuming games) to Samsung's VR headset. "VR still emerging, but with Milk VR it's more within reach," said Tim Baxter, president and COO of Samsung Electronics America. 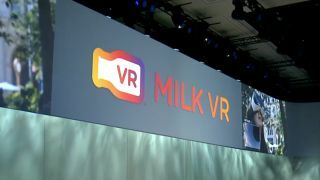 Milk VR was rumored in late December, and today we have Samsung's official word on its existence. Samsung also revealed that its Milk Video service is headed to all Samsung smart TV as well as PCs. Milk Music will find a home in Samsung's Multiroom App 2.0.